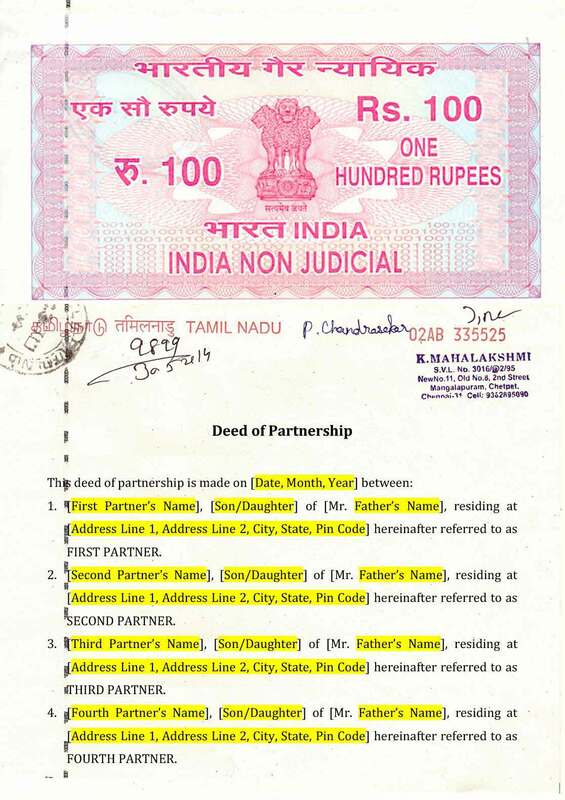 You can also download the Partnership Deed Format in the following formats. Partnership Agreements are be used by Partners wishing to form a partnership for doing business together. It is strongly recommended or encouraged for partnerships to have some kind of agreement among themselves, in case future disputes prove difficult to arbitrate. It is meant to promote mutual understanding and avoid mistrust. It indicates the terms on which the business corporation is founded. Also, registration of a Partnership will make the firm eligible for obtaining PAN, applying for bank loan, opening bank account in Partnership Firm name, obtaining GST registration or IE Code or FSSAI license in partnership firm name and more. 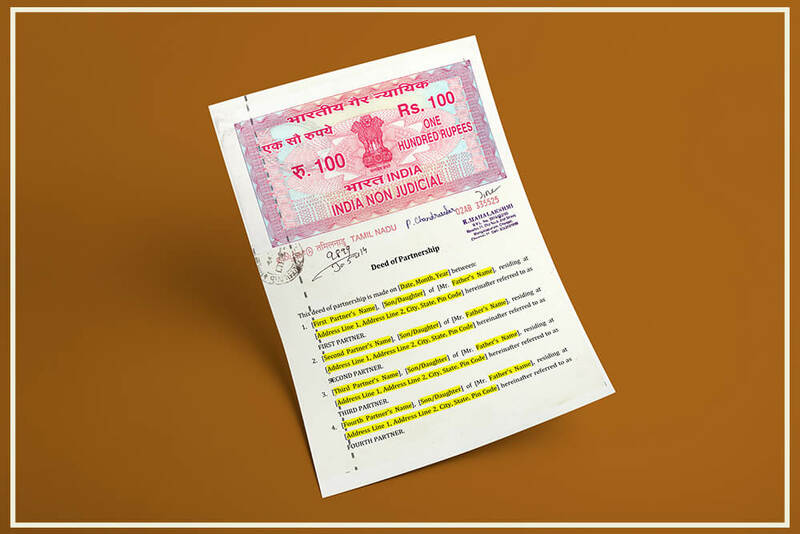 Partnership agreement must be printed on a Non-Judicial Stamp Paper with a value of Rs.100/- or more based on the value of properties held in the partnership firm. The partnership agreement is usually signed in the presence of all the partners and each of the partners would retain a signed original for his/her records. Once the document is signed by the Partners, the document is witnessed and the signed partnership deed is held by each of the Partners is duplicate or triplicate. Greetings from Ideal bio science pvt.ltd. I just gone through your model partnership deed.I am enlightened.Your service is very useful for the beginners like me.We have planned to utilise the services of Indiafillings. Need a comprehensive and upto date Partnership Deed to incorporate & register a Partnership firm between TWO Individuals. I do not see any Links for the same, so please revert asap. no clause to add the firm name.Why? need more clauses such as goodwill/interest on capital/admission of partner/ dissolution of firm. sir a partner is going to die and we want her wife to become partner as successor how can we do so and what deed we have to execute. 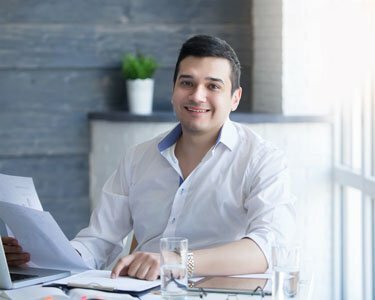 sir, if i register my firm in partnership…can i used my firm name as private limited..and secondly should i registered again the firm in shop and establishment act in the state How many tax registration required initially in service sector..
We are 3 friends want to form a Partnership business. Our initial investment is Rs: 300,000/-. So please reply us with full procedure in step by step to register the firm and get the trade licence etc.